There are records of Streetwide Houseparties as early as 1908, though it's possible that they're older. Lewis S. Mudge '51 described the 1908 Houseparties as "prim, correct affairs," in line with conventional social standards of the time. 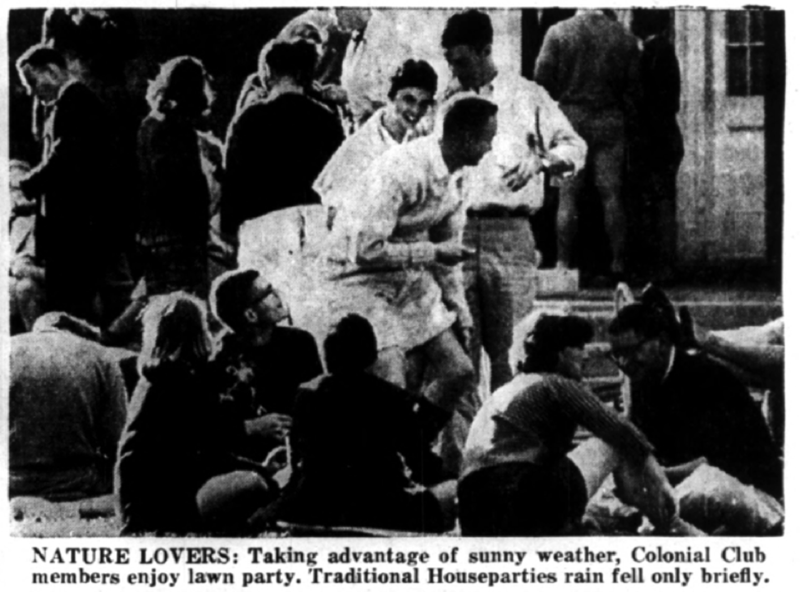 Even the major newspapers of New York and Philadelphia would cover Houseparties, sending photographers to campus. Students had to find dates from outside the college, and so Colonial Club made sure to host an event known throughout the Northeast. Indeed, women would travel from around the country to be the dates of Colonial men, and the Daily Princetonian would publish their names and member affiliations. The 1920 Houseparties were traumatically memorable for attendees at Colonial. During the weekend, fires broke out on campus and destroyed Dickinson Hall and the Marquand Chapel. It was the most destructive fire in University history. Like many early club traditions, the vibrancy of Houseparties was threatened by the rise of Prohibition, although archival evidence suggests that there was drinking aplenty within Colonial during the 1920s. In 1921, the Graduate Board ousted the undergraduate president for hosting parties, including Houseparties, in gross violation of federal bans on booze. A favorite pastime of the era was the “Duck Soup Club.” Colonial members met at infrequent festivals and drank anything they could procure, provided a celluloid duck floated in the center of the punch bowl. This was also the the origin of Colonial’s famous milk punch, still made from scratch from the original recipe and served every year at Reunions. Luckily, Colonial and its members were largely spared by the Great Depression, and Houseparties grew in extravagance throughout the 1930's. Incoming classes of Colonialites made it their mission to throw a wilder, louder party than before. In the spring of '39, Colonial's hired musicians blasted deafening music into the night, guests spilled out onto Prospect Avenue, and some even wandered down Nassau Street. A number of Princeton students were arrested. Case Morgan '49 described the 1939 Houseparties as a crescendo. 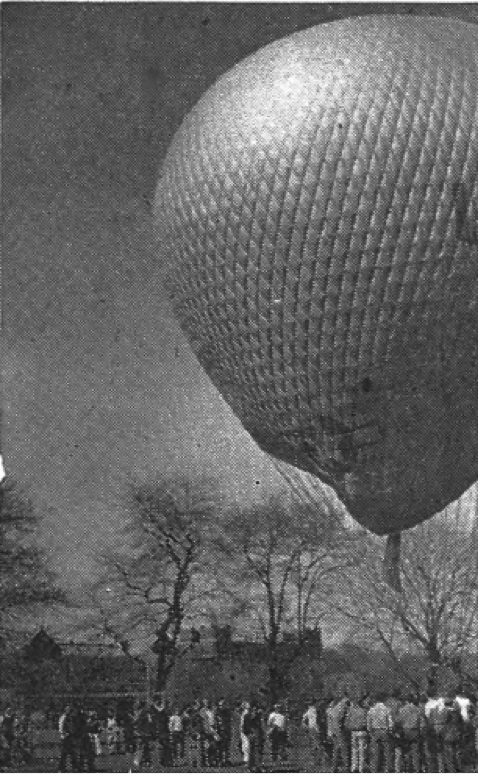 "Ever since the early twenties, each year had been bigger and better than the rest, and 1939 seems to have been the ne plus ultra." By the the fall of 1939, the jovial mood of the previous spring had soured. Hitler had invaded Poland, and Europe was in the early stages of yet another catastrophic war. Furthermore, when word of the previous spring's bacchanal spread to school administrators, members' and guests' parents, and the surrounding community, many were less than pleased. It was later reported that "a storm of protest broke around the heads of the University authorities after the weekend. Parent Associations, Girls' Schools and Colleges, Social Unions, professors and even a few undergraduates complained that the whole thing had gone too far. The escapades of 'Princeton Playboys' had lost their humor and had become disgusting to a majority of the people concerned." In 1940, the University issued an official warning to Colonial regarding the outrageousness of its Houseparties. Supposedly it was to be the club's "last chance." Colonial complied, and the Houseparties of 1940 and 1941 were, consequently, mild. Just like when we beat Dartmouth in the fall. The skirts which I have seen I now can see no more. Oh hell and utter woe! In December of 1941, members enjoyed a lazy weekend brunch at Colonial. That afternoon, they huddled before the fireplaces to study. It was a serene moment. Over the next several days, however, uncertainty and confusion gripped Colonial as the news trickled in: Japanese planes had launched a surprise attack on Pearl Harbor; Congress and President Roosevelt had declared war. Suddenly, the Housparties of old seemed irrelevant as members, friends, and family faced the prospect of military combat. Like in the First World War, many students left to fight. The Prince published a furious editorial against Houseparties, asking if Princeton was a "Country Club or a University at War." Colonial in turn altered course, shifting Houseparties to a single night in 1942. Of course, we still celebrate Houseparties today. Nothing, not even wartime, could dampen the spirit of Colonial. One courageous social chair, who had never himself been to a Houseparties weekend, worked with the other clubs to reinstate the time-honored tradition. And in 1946, the club institutionalized the "Running of the Colonial Downs" to celebrate their resurgence (a custom that lasted well into the 1980's). Named after the Colonial Downs race track in New Kent County, VA, this famed event consisted of boisterous matches of croquet and accompanying hors d'oeuvres on the front lawn. Of course, not all were overjoyed: the administration remained skeptical of Houseparties, and in 1948, a prominent French psychologist visiting the University lashed out publicly at their return.